For my TE 466 self-branding assignment, I will be performing a self-analysis. To begin, I will do a strength/weakness analysis of myself in the form of a table with explanation/thoughts. I will then do an external informal survey of my friends and family by asking them to list my strengths, weaknesses, attributes, characteristics. I will take the results from this survey and perform a congruence analysis. Then I will create a feature-benefit model of myself that reflects my personal brand. Doing a strength/weakness analysis of myself was difficult. Not only do you have to have a level of self-confidence to think about your strengths, but you also have to have the self-awareness to expose your own weaknesses in writing. Nevertheless, I put on my self-reflecting cap and wrote anything that came to mind. I feel that the strengths/weakness chart that I wrote were indicative of how I think of myself. The following table contains a list of my proposed strengths and weaknesses. I will first explain each strength one-by-one and then explore my weaknesses after. Strengths are what make you qualified for a job, better than the next candidate, and excel in the workforce. I believe that the strengths that I analyzed have been demonstrated in my college career or industry experience. I am passionate about technology. Passion drives me to continuously self-improve my technical expertise and mindset. Even if working on a project does not yield me any money or “A” on my transcript, I often find myself learning and making things regardless of their reward. The ability to quickly learn something finds itself useful is a myriad of ways. Whether it be working on a foreign task at work or taking a class on an entirely new subject, my ability to quickly learn a field or subject has proven to be one of my most helpful strengths. I believe that if someone does not know much but is a quick learner, they will be more successful than someone who already knows a lot but is a slow learner. Being friendly is a virtue of mine. I believe it is important to treat others the way you want to be treated. This especially applies in the workplace as it is important to foster nurturing relationships with your coworkers rather than detrimental ones. Having a strong technical background is simply a function of my passion and hard-working attitude. As I choose to work hard on subjects or fields that I am passionate about, my technical background directly benefits. Although being a natural leader is not obvious to me, I often find myself in situations where the decision to take the initiative as a leader comes natural. Weaknesses are things that I felt that I should improve on. These are the things that I feel do not necessarily define me, but make it harder for me to excel on the job. 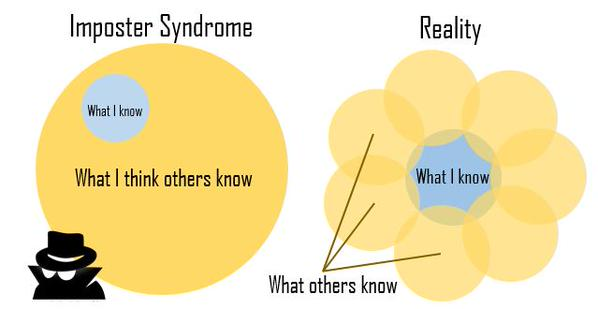 My most interesting weakness is impostor syndrome. I strongly believe everyone has the potential to do great work, but it is a matter of their ability to hone their strengths and make them useful. The impostor syndrome is a psychological pattern in which individuals doubt their accomplishments and have a persistent internalized fear of being exposed as a “fraud”. Although I do not think this is a devastating weakness of mine, it still requires careful thought. I often find myself doubting my ability to accomplish a task and need to realign my perspective to motivate myself. The following diagram does a great job of explaining this phenomenon. After interviewing a dozen of friends and a few family members, I came up with a summary of myself based on other people’s perspective. The consensus was that I was a really hard-worker with lots of self-motivation. This was mainly due to a proven track-record of working hard and doing difficult things. Whether it was taking a lot of classes, going the extra mile at work, or working on a lot of personal projects, my peers felt that I had the qualities of a hard worker. I was very proud of this strength and I think it is a quality that differentiates me from other people. Another strength that aligned was my friendliness. My peers felt that I was generally a friendly and thoughtful person based on anecdotal experiences. I also found out that most people think that I can be stubborn. This observation did not surprise me as stubbornness is an obvious character of mine. I can think of multiple situations where I believed my idea or method was superior without considering the ideas or methods of others. This is something I am always working on and feel has drastically improved during my time in college. No one mentioned anything about impostor syndrome or impatience. I was not surprised that no one mentioned impostor syndrome as it is an internal psychological phenomenon that is not outwardly obvious. But I was surprised that no one mentioned my impatience. I know from experience that I tend to get impatient when it comes to results or finding solutions—maybe it is a sign of improvement. I was lucky to find that my friends and family’s perspectives of me aligned with my self-analysis. I think this is a testament to some of my self-awareness but obviously requires a larger sample size to truly determine the reality of other people’s perspectives. It is hard for friends/family to write about your weaknesses without exposing too much about what they think of you. It is good to know that there is congruence between my self-analysis and the external analysis because it means that I am self-aware and can expedite the self-discovery process for my weaknesses. My “feature-benefit” model relies on my unique combination of strengths. Each strength is a ordinary, but in synergy with my other strengths, becomes a whole greater than the sum of its parts. If chosen for a task, I will be able to use my quick learning and passion to get the job done quick but also with quality. My hard-working attitude will keep me working even through rough times. And provided with a team, my friendliness and natural leader strengths will help my team work together as a whole.